During the development of automotive functionalities, a large number of dedicated tools is being used – from requirements, through design, to implementation and testing. Data exchange between these tools is often not supported in an efficient manner. Transformation of data between different formats and meta-models is required. The Eclipse ecosystem provides a rich infrastructure for these use cases. In this example, we are going to show how EMP (Eclipse Modeling Project) can be leveraged to support them. We will demonstrate EMP usage based on the XML format of ADTF. ADTF (Automotive Data and Time-Triggered Framework) is a tool that is being used in the development of automotive functions. It supports data exchange through an XML format. In our case, we wanted to transform the ADTF data from and to a SysML-based tool by using the powerful features of the Xtend language and the further features of EMP, e.g., EMF Compare, Graphiti, Sirius, etc. This blog posts lays out the required steps. This happens not only in ADTF, but also in AUTOSAR (Artop) and ReqIF. So we are reusing the org.eclipse.sphinx.emf.serialization.XMLPersistenceMappingResourceImpl implementation class from Eclipse Sphinx to create our specific EMF resource that supports exactly that. The getEObject method will be called with the value of the type=”…” attribute in the XML. We provide a simple implementation that will just traverse the entire model to find the element with the name being passed. A more sophisticated implementation might do some additional caching, but the performance is sufficient for our use cases. The XML code defines the namespace for the adtf prefix, but the following lines (<header>) do not have any prefixes, and namespaces are not inherited. This means that all the following lines are in the XML default namespace and thus not recognized in the model. 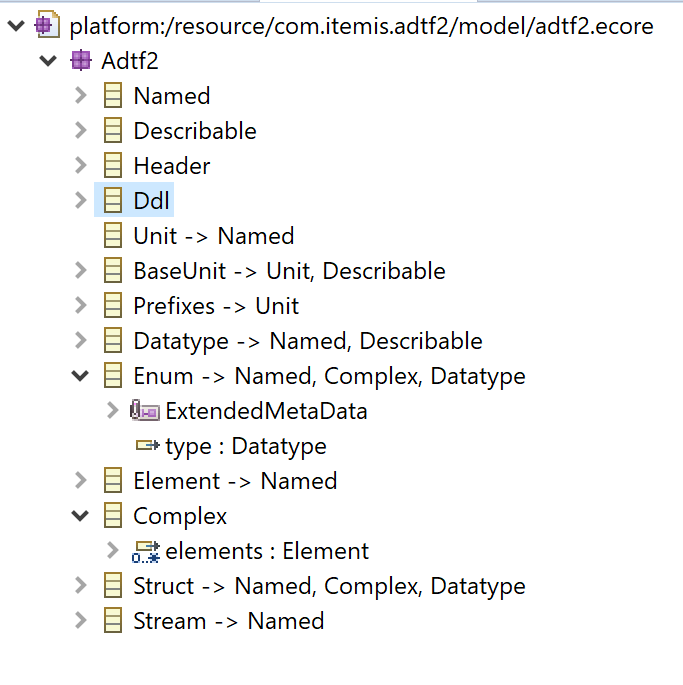 So we need some code to tell our resource to treat everything without a prefix as belonging to the "adtf" namespace. With the steps outlined above, we have access to a full EMF model representing our XML, and we can now leverage the entire ecosystem of the Eclipse Modeling project. Our main use case is model-to-model transformation, but there is a rich set of features to support many integration use cases with other tools.